Metadata are an essential part of a robust data science workflow ; they record the meaning of each variable : its units, quality, allowed range, how we collect it, when it’s been recorded etc. Data without metadata are practically worthless. Here we will show how to transfer the metadata from PostgreSQL to R.
In PostgreSQL metadata can be stored in comments with the statements COMMENT ON COLUMN... or COMMENT ON TABLE.... So I hope your tables have this nice comments, and you can see them in PgAdmin for example. But what about R ? In R metadata can be assigned as attributes of any object and mainly as « labels ». We will use the Hmisc package which provides functions to manage labels. Another interesting package is sjlabelled. You may also have seen labels when importing labelled data from SPSS for example. or more precisely union many spatial tables in R in a tidy way. base::rbind only works on two tables and so that’s not straightforward to use*. So we’ll use purrr::map and tidyr::unnest. We can then create a 3 rows data frame containing a list-column in which we store the sf object. Then we just unnest it. This operation erases the sf-class, we have to add it back. Bonus : we have the source filename stored in the resulting shapefile. Mastodon is a decentralized microblogging platform. 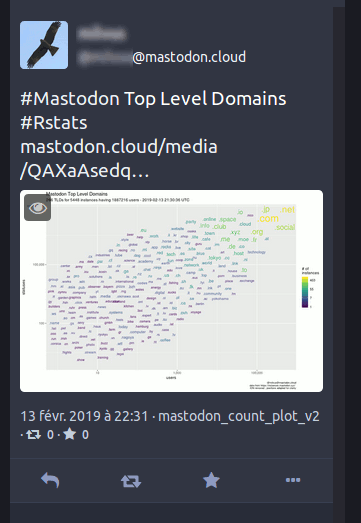 We can analyse some data and directly post our findings to a Mastodon instance. 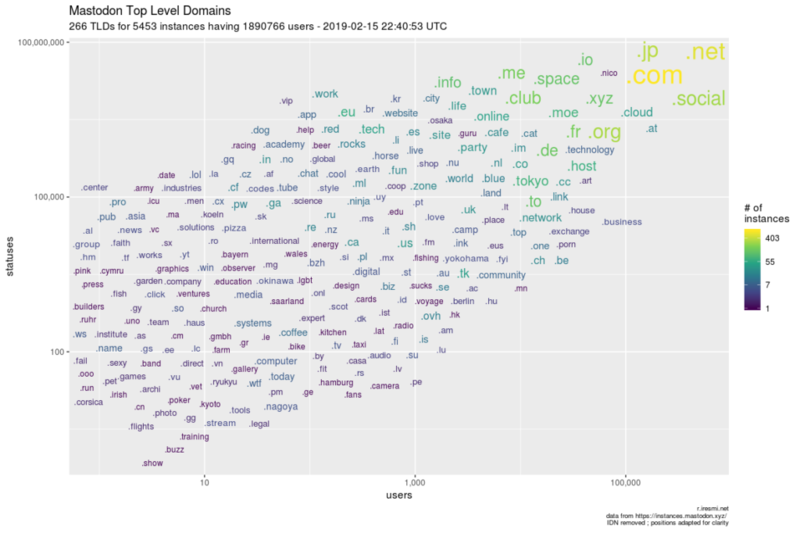 For example we can plot the different TLDs used by the Mastodon Fediverse and publish it on mastodon.cloud. Before posting we have to create an authorization token once. We can then post the created image and its accompanying status. The use case is to create the same plot in different languages. I used this technique for Wikipedia plots. We are going to build a list containing all translations, we will then loop over each language, generating and saving the plot. title2 = "Měsíční změna (průměrná roční odchylka)"
We will use dplyr::nest to create a list-column and will apply a model (with purrr::map) to each row, then we will extract each slope and its p-value with map and broom::tidy. Map data. 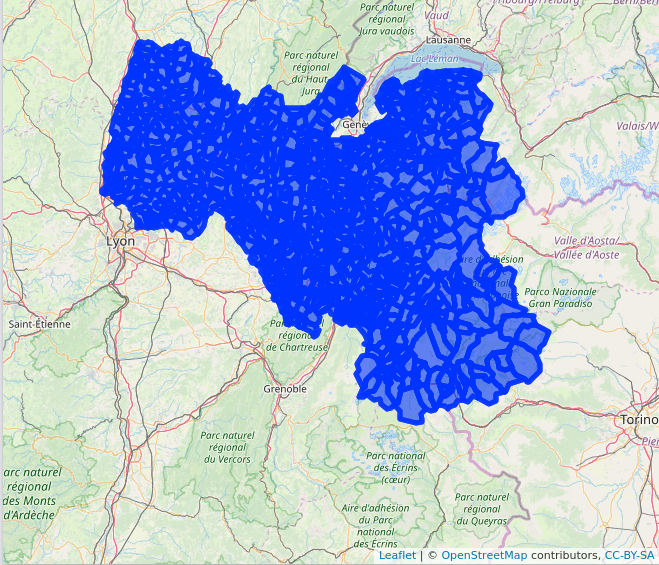 Départements polygons from OSM. 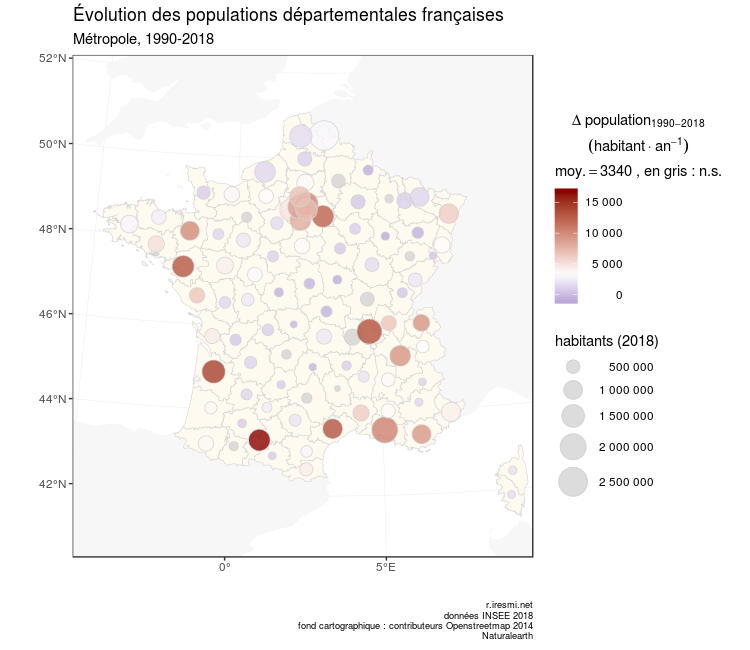 Population data by département 1990-2008 from INSEE. 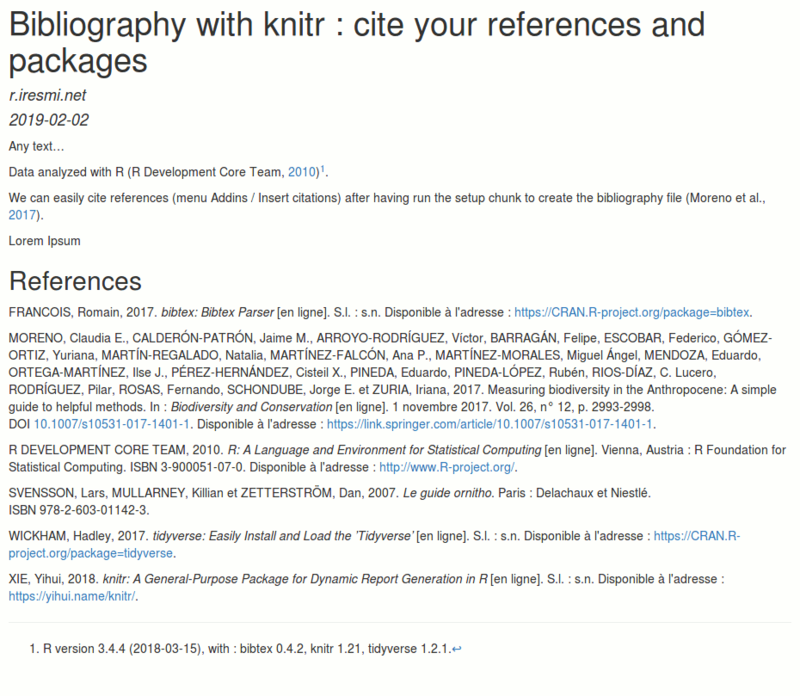 A tutorial to use your Zotero references with rmarkdown, easily add the references, automatically generate your bibliography, including the packages used in your document. It’s a good practice to cite the R packages you use in your analysis. However it can be cumbersome to maintain the list of your package’s references in Zotero while the packages used can change in your script. Here we use the automatic updates of Zotero to generate our main bibliography and we auto-generate the package bibliography and then merge them. 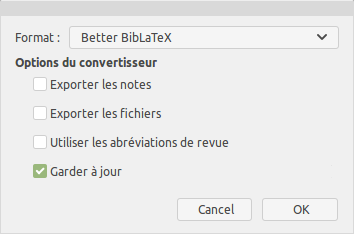 Install Better BibTex for Zotero. To easily add citations in the rmarkdown text in RStudio, we can add the citr package. Create a collection for our project. Export the collection (BibLatex format). Tick the update option. We can also add a personalized CSL file (used to format references) in your R project folder (see the repository). Below I chose ISO-690 (author-date, no abstract, French). In the setup chunk, we load the required packages, generate the .bib file for the packages, merge it with our Zotero bibliography and add the packages as nocite (they are not cited in the text but have to appear in the references). We must run the setup chunk at least once to generate the files and check which citation to use for the packages that provide multiple references. We can then carry on our analysis with R chunks and some text with citations. The citations can be added with [@key] where key is the citation key generated by Better Bibtex and found at the top of the Zotero info panel. Or we can use citr which will help us find it (Addins menu in Rstudio > Insert citations). The bibliography will be added at the end of the document. title: "Bibliography with knitr : cite your references and packages"
Data analyzed with R [@r_development_core_team_r:_2010][^r_version]. [^r_version]: `r version$version.string`, with : `r paste(lapply(sort(packages), packages_versions), collapse = ", ")`. We can easily cite references (menu Addins / Insert citations) after having run the setup chunk to create the bibliography file [@moreno_measuring_2017]. r.iresmi.net, Fièrement propulsé par WordPress.